This week we wrap up our Rogues Gallery PDF series for Mutants & Masterminds. Look for more about a Rogues Gallery compilation in an upcoming Ronin Round Table. A string of mysterious murders in Freedom City, and the police have no suspects, and no evidence, apart from the broken and discarded children’s toys left behind at the scene like some kind of grim calling card. Who—or what—is the “Nightmare Child,” what is driving it to kill, and how can the heroes find and stop it before it claims its next victim? 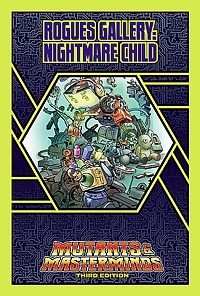 Get Nightmare Child today—just $1.95!